You’ve either seen the video or heard about the group think that happened before NASA’s Challenger exploded in 1986. One engineer felt strongly that there was a defect in the Challenger’s design. He spoke up, others disagreed. He continued to speak up, until it became very uncomfortable to do so. Most employees don’t even get that far. Many employees are afraid to speak up at all, feeling that it’s not ok to have a counter point of view, and that those who disagree with ‘management’ are eventually fired. I honestly am not sure where this comes from. It hasn’t been my experience, and yet the fear of speaking up is pervasive. I hear it in almost every organization with which I work. If it’s not ok to express different opinions, your organization will deliver the same-old products and services you always have. If staying the same works in your industry, great. But stagnation is a killer to most organizations. 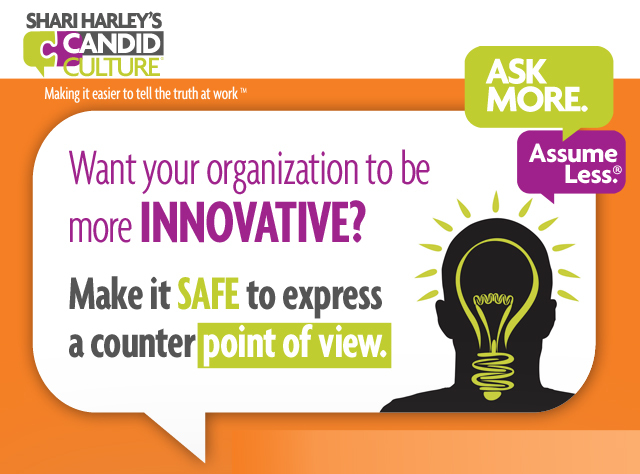 If you want more innovation in the workplace, you have to make it safe to speak up and offer a different point of view. Saying new, different, and even controversial things must be encourage and rewarded. Ask for new ideas and different points of view. Wait until you get both. Don’t allow a meeting or discussion to move on until you get new, opposing, and different points of view. 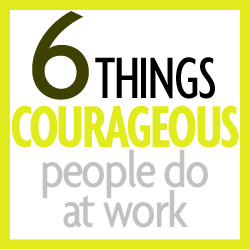 Positively acknowledge people who risk and say something new or different from the norm. Ensure people with new ideas and different points of view are allowed to finish speaking before they’re interrupted or before someone else tries to negate their ideas. Create a few new awards in your organization and announce winners publicly and with great fanfare. You get what you reward. Acknowledge the person who fails massively trying something new. Award the person who brings new ideas to the table, regardless of what happens to those ideas. Celebrate the person who willingly gives you the worst news. The fear of speaking up and saying something new or different will kill your innovation efforts. It will also kill your employees’ ambition and ability to be creative. Make it safe to tell the truth, even when the truth is hard to understand or unpopular, and see what happens to innovation, creativity, and employee productivity and morale. It’s hard to watch people do things that damage them – personally or professionally. And yet, if they haven’t asked for feedback, people likely won’t listen to unsolicited advice, so don’t bother giving it. 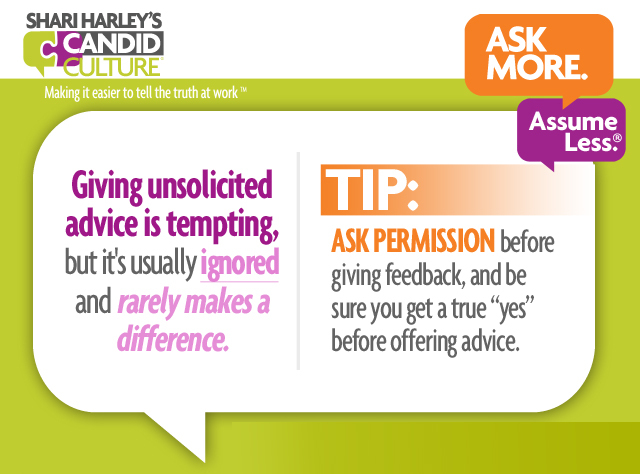 If you really want to give unsolicited advice, ask for permission and make sure you get a true “yes” before speaking up. After you offer to talk (aka, give your opinion), listen and watch the response you get. Does the person’s words and body language portray a true “yes, I’d like your opinion” or what seems like an “I’m supposed to say yes” reply? 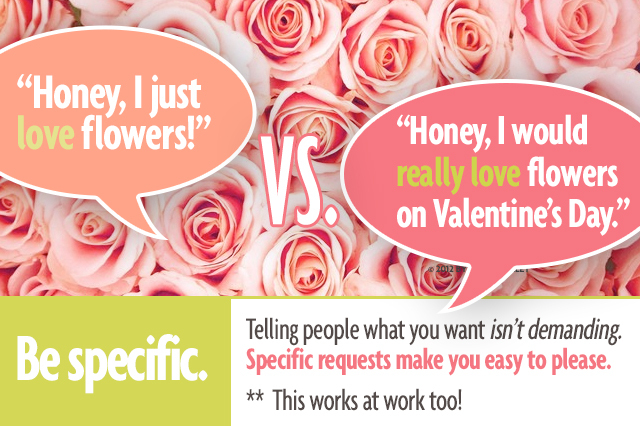 If you get the latter, you’re likely just giving unwanted advice that won’t be heard. If that’s the case, let it go. But if the person appears generally interested and open, proceed. If you make the invitation to talk, the other person has to be able to say no. An invitation is only an invitation if no is an acceptable answer. You can’t ask if the person wants your input and then keep talking even if he verbally or physically said no. Be brave. If you care about someone personally or professionally and you see him doing something that gets in the way of his success, ask permission to say something. If you get the go ahead, proceed. If you get a “no thank you,” accept that and move on. You’ve done your part. Read How to Say Anything to Anyone, and get the words to have even the toughest conversations. Companies want people who make things happen. And to make things happen, you have to speak up. No, anticipating the train wreck and commenting after the train goes off the tracks doesn’t count. What if you said what you thought, in a way other people could hear you, when you had the right to do so? Meaning, you have the relationship with the other person to tell the truth and you’ve asked permission to be candid? Look for opportunities to make things better. Ask for permission to take the ball and run with it. Build relationships with other people who are making things happen. Don’t say yes, when they mean no. Find a way to say no, while engaging the other person in a conversation so a new approach is generated. Are willing to go out on a limb, work hard, and fail. Look for and present solutions, not merely problems. Offer to do the work to move towards a better way of doing things. Don’t drop problems at your other people’s doors. Many people are afraid to speak up at work and believe that people who speak up get fired. I haven’t found this to be the case. People who work hard and produce results are typically the last people to be let go. Say what you think in a way that is not critical; offer solutions not just problems; be a force for good and take an active role in making things better, and my hunch is your career will accelerate faster than you ever thought possible. I’ll never forget a coaching meeting I had about two years ago. I gave the manager I was coaching some tough feedback and he replied by saying, “I know I do that.” So I asked him, “If you know this is an issue, why are we having the discussion? He told me, “I just figured this is the way I am.” And I realized that knowing a behavior is ineffective doesn’t mean we know what to do to make things better. 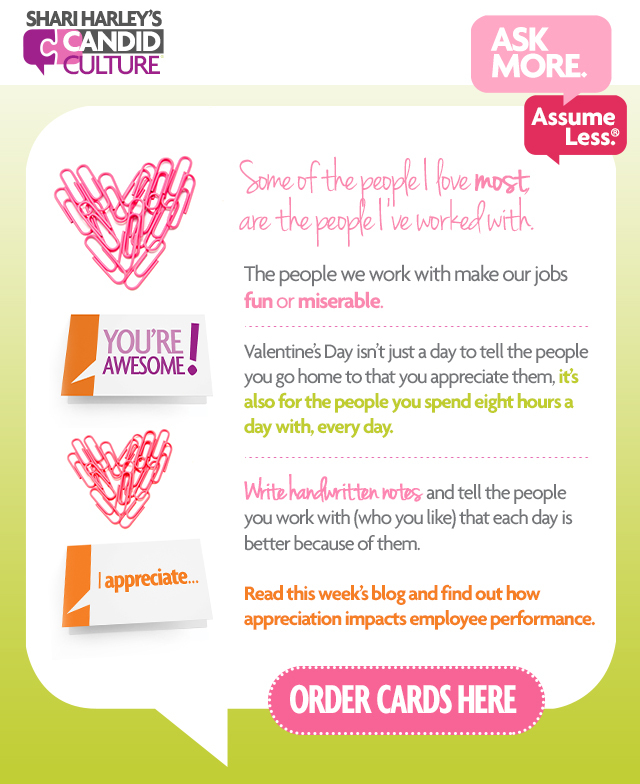 The people you work with want to do a good job. They want you to think well of them. Yes, even the people you think do little work and/or are out to get you. Give people the benefit of the doubt. Assume people are doing the best they know how to do. 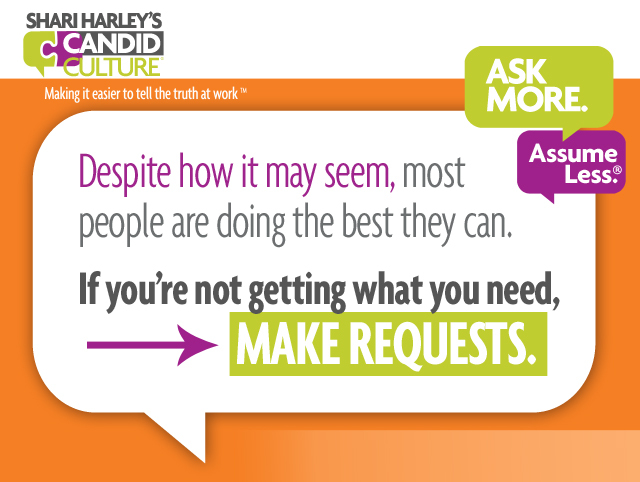 And when you don’t get what you want, make requests. There are two ways to give feedback. One way is very direct. The other way is less direct. Rather than telling the person what went wrong, simply make a request. It’s very difficult to give feedback directly without the other person feeling judged. Making a request is much more neutral than giving direct feedback, doesn’t evoke as much defensiveness, and achieves the same result. You still get what you want. When I teach giving feedback, I often give the example of asking a waitstaff in a restaurant for ketchup. Let’s say your waiter comes to your table to ask how your food is and your table doesn’t have any ketchup. Both methods achieve the desired result. Option one overtly tells the waiter, “You’re not doing your job.” Option two still tells the waiter he isn’t doing his job, but the method is more subtle and thus is less likely to put him on the defensive. You are always dealing with people’s egos. And when egos get bruised, defenses rise. When defenses rise, it’s hard to have a good conversation. People stop listening and start defending themselves. Defending oneself is a normal and natural reaction to negative feedback. It’s a survival instinct. You’re more likely to get what you want from others when they don’t feel attacked and don’t feel the need to defend themselves. Consider simply asking for what you want rather than telling people what they’re doing wrong, and see what happens. I will admit, asking for what you want in a neutral and non-judgmental way when you’re frustrated is very hard to do. The antidote is to anticipate your needs and ask for what you want at the onset of anything new. And when things go awry, wait until you’re not upset to make a request. If you are critical, apologize and promise to do better next time. It’s all trial and error. And luckily, because most of us aren’t great at setting expectations and human beings are human and make mistakes, you’ll have lots and lots of chances to practice giving feedback and making requests. You know when someone gives you ‘the tone’. Similar to when people roll their eyes at you, when you get ‘the tone’ you’re being told that the other person is exasperated. Tone of voice communication is one of the hardest things to coach because we don’t hear ourselves. 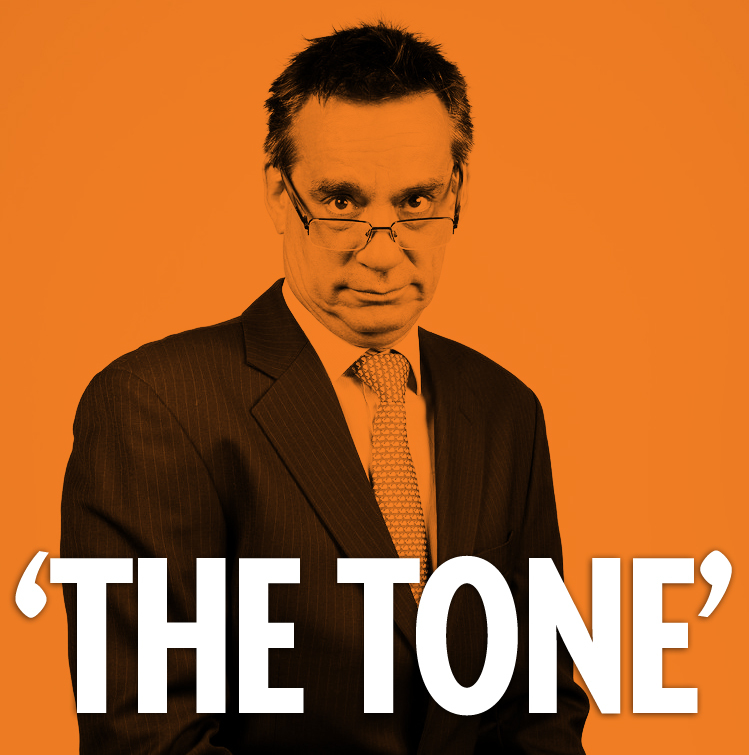 People who give people ‘the tone’ rarely know they’re doing it. One of the best ways I know to effectively coach tone of voice is to ask tone givers to tape themselves during phone calls. Then listen to the recording together and ask the tone giver, “If your grandmother called and someone spoke to her that way, would you be happy?” You can also read written correspondence out loud, adding the tone you ‘heard’, and ask the sender how she would have interpreted the message. When given the tone, most people feel judged. And when people feel judged, conversations are constrained. The way to avoid giving ‘the tone’ is to come from a place of curiosity. When you ask the question, “What were you thinking when you approached the customer that way,” you can sound curious or judgmental. Being judgmental evokes defensiveness, which shuts conversations down. Being curious creates discussion. • What’s the history behind…. • Why do we do it this way? Any of these questions will lead to good discussion, if you manage your tone. If you want to get information or influence someone, ask questions and engage the person in a dialogue. We often try to persuade people by giving them information. This rarely works. Instead of over loading people with data, ask questions which evoke discussion. Through discussion you might get to a different place. And if not, you’ll at least have learned why the other person thinks as he does and you will have shared your point of view in a way that is inviting versus off putting. It’s easy to give people ‘the tone’ when we’re tired and frustrated. Try to avoid difficult conversations when you’re tired or stressed. Wait to have important conversations until you know you can manage yourself and your tone. A few years ago, the guy I was dating asked, “We don’t really need to do anything for Valentine’s Day do we?” I was taken aback by his question (which was really a statement) and replied, “No, we don’t.” But I didn’t mean it. And when he blew off the ‘holiday’ I was furious and let him know it. Instead of having dinner on Valentine’s Day, we had an ugly conversation and a lousy rest of the week. Asking for what I wanted upfront would have been much less painful. We aren’t likely to get what we don’t ask for. The people in our lives can’t read our minds. They don’t know what we want. This is true at home and at work. If you want a report to look a certain way, sketch it out for your employees. If you want a meeting handled in a certain fashion, give detailed instructions. For the most part we expect things to go well and thus we delegate insufficiently at work and hope to be pleasantly surprised at home. Ask for what you want and see what happens. Last week I was upset, really upset. I worked hard to practice what I preach when giving feedback – wait to talk until I’m calm, ask questions, and no matter what happens, don’t send a text message. It was hard, really hard. I was mad and wanted to say, “What the *&^#$@?” But I know that when people receive negative feedback they feel judged. And when people feel judged, they become defensive, making it very difficult to hear what the other person is saying and have a conversation. What do I want to have happen as a result of the conversation? How do I need to approach the conversation to get that result? Last week one of my employees tipped me off that the people who work for me are on to me. They’ve read my book. When I ask, “Help me understand; what happened the other day,” they know that feedback will follow. You don’t want to approach your relationships and conversations in a formulaic and inauthentic way. Inauthenticity stinks and it can damage relationships more than freaking out will do. But it’s not a terrible thing to put someone on notice. If the people who work with me know that negative feedback follows the question “what happened,” they know the conversation is important. Yes, they’ve been tipped off and perhaps as a result they’re on the defensive, but I still think asking “what happened yesterday” is a heck of a lot better than raising your voice, accusing, and asking questions later. Asking questions to discuss thwarted expectations is hard to practice. It takes great self-management, which I don’t always have. I mostly practice what I teach, and when I don’t, I clean up the mess I’ve made, apologize and recommit to doing so in the future. And you can do the same. Holiday Promo – $12 a book for 7 or more books. Wait to give feedback until you won’t freak out, but don’t let situations fester and become bigger than they need to be. Have the conversation as soon after an event as possible. If something is important to you, ask for it. Trying to persuade yourself that it isn’t a big deal and might be your issue, probably won’t help. We want what we want. Be true to yourself. And when you find that you’ve put the other person on the defensive and s/he feels judged, work to do better next time. But in the end, speaking up is always better than stuffing how you feel, even if you handle the conversations differently than you had planned. During the holidays we often see people we haven’t seen in a long time. Your family and friends care about you and want to hear what’s happening in your life. Caring and curiosity can lead people to ask questions that you don’t want to answer. Friends and family don’t need to know everything that’s happening in your life. 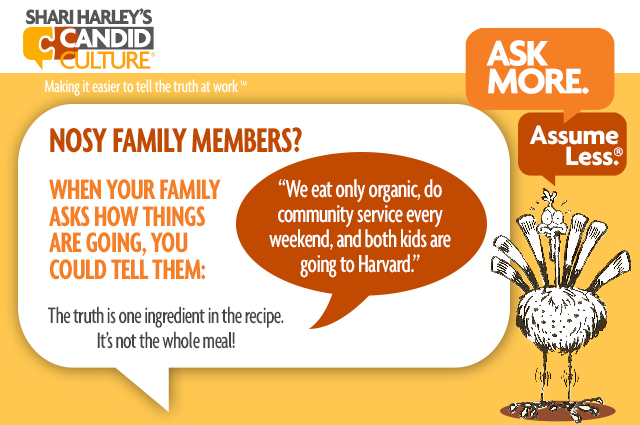 None of your business – said a bit differently – is a perfectly acceptable reply. You decide what to share. Answer: “We like each other a lot. If it goes further, I’ll let you know.” Aka, this conversation is over. Answer: “I really appreciate your interest. I’m not looking for dating advice right now, but I really appreciate your concern.” Aka, shut up. The examples above are about romantic relationships but they could have been about careers, kids, or finances. Your response can be the same. You don’t need to tell anyone anything you don’t want to. It’s ok to tell people to back off and that something is none of their business. You can say it nicely. Just don’t let yourself get cornered into giving information you don’t want to share. Telling someone to back off is perfectly appropriate. S/he’ll get the point and your personal life will remain personal. Boundaries are your friend. Read How to Say Anything to Anyone, and be ready to manage intrusive questions and unsolicited advice this holiday season. We’re offering a special holiday deal. It’s the best price you’ll find anywhere. 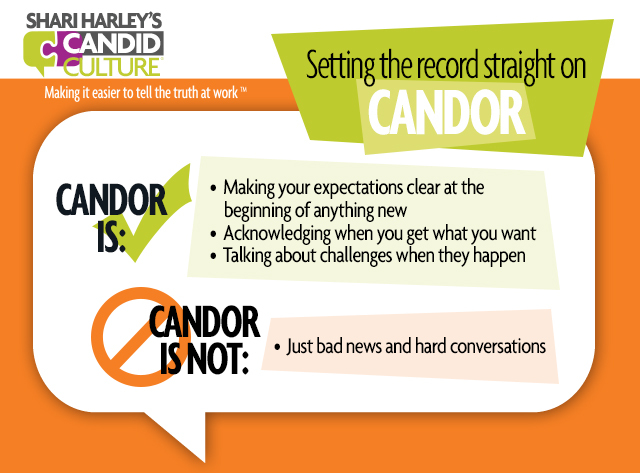 By Shari Harley, Keynote Speaker and Founder and President of www.candidculture.com.